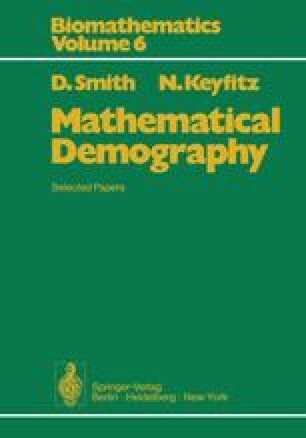 Leslie’s work, rather than that of his predecessors Bernardelli and Lewis, is most commonly cited in the widespread literature using matrices, largely for the reason that Leslie worked out the mathematics and the application with great thoroughness. Some of his elaboration was designed to save arithmetic—for example his transformation of the projection matrix into an equivalent form with unity in the subdiagonal positions. Such devices, like a considerable part of classical numerical analysis, are unnecessary in a computer era. From Biometrika 33. Excerpts are from pages 183–185, 187–193, 199–202.